I liked Zoe best as she was trying really hard to save her dad. I would definitely recommend this book to someone else! I thought it was really good. I would totally recommend this book for about 7-11 years. this book is about a girl called Zoe ,her mother died when she was a baby. She has a stepmother called Sheila, Tina Trots is the local bully in the school. At the start, it talks about Zoe's dead hamster, Gingernut. Before Gingernut died, she taught him to do tricks to make people go wow. This book (SPOILER ALERT!!!) made me so sad and angry at times that I felt like punching a pillow! One time, at the start of the story, was when Zoe's horrid stepmother killed her rat(Zoe found out at the end of the story) My favourite bit was when and how Burt and her stepmother die at the end. Read the book the find out! Zoe is a kind and loyal girl, but Burt who is a man sells burgers with rats!!!! but in the end, he use the beef mince machine to kill rats. 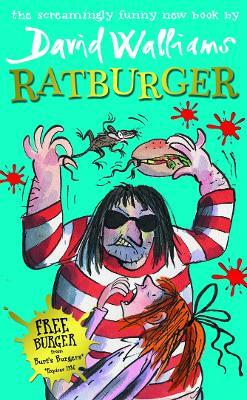 I think that Ratburger is a great book because it's really funny and you never know what is going to happen next. My favourite character is Zoe because she is brave and even though she is scared she's determined to help others who are kind to her, even animals like rats! I think it was funny but disgusting when Zoe was trying to break out of her bedroom and when her step mother came into her room, Zoe put her braces back in even though they were covered in dust from trying to break free! I would recommend this book to lots of my friends. I definitely recommend this book to someone because it is a very sad story because Shelia says, that she has to bin the pet hamster but then Zoe get's the hamster out the bin and she buried the hamster. YOU SHOULD READ RATBURGER!!! Very exotic and funny.Really liked how some of the things happen in real life and some are impossible! I think this book was amazing! It was hilarious! It was fiction. My favourite character is Zoe, a little girl and the main character. It interested me because it was written by David Walliams. I would reccomend it for all readers above 7+. Not one of the best books but still a good book. I liked how Zoe got her revenge on her Step-mother and Bill at the end. I liked the book because I liked the girl called Zoe and that she was pet friendly and I liked that her stepmother called Sheila was so lazy that she made Zoe pick her nose. i thought it was amazing.Because David Walliams books are so funny. Another funny book by David Walliams. My favourite characther was Zoe's Dad because he was kind and protected Zoe. I would recommend this book to children aged 7 and over. Can get disgusting at times but I recommend this book for all ages!! !